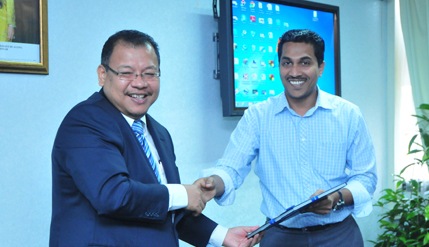 BANGI, 19 July 2014 – The National University of Malaysia (UKM) is set to strengthen its collaboration and strategic partnerships with various companies operating in the Bangi industrial area. This was the outcome of a round table discussion dubbed “UKM4Bangi Industry Strategic Partnerships for Talent Development, Research and CSR Collaborations” it had with four industrial and commercial entities operating here recently. The companies are SAPURA Industrial Bhd, PERMANIS Sdn Bhd, DENSO (M) Sdn Bhd and HITACHI Electronis (M) Sdn Bhd. Vice Chancellor Prof Datuk Dr Noor Azlan Ghazali who led the discussions lamented about the lack of knowledge and relations UKM has with its neighbouring areas. He said though cooperation between the university and the industry is nothing new but its relations with its neighbourhood is somewhat lacking. Deputy Vice Chancellors Prof Dato’ Dr Saran Kaur Gill (Industry and Community Partnerships) and Prof Ir Dr Riza Atiq Abdullah OK Rahmat (Academic and International Affairs) also took part in the discussions together with Deans of Faculties, Heads of Departments and Directors of Institutes. Prof Noor Azlan said UKM has signed a number of MoUs (Memorandums of Understandings) with universities in Japan, Indonesia, Germany, Korea and had also forged relations with various governments departments with great success but regretted that it knew very little about its neighbours. Bangi, he said, has its fair share of higher educational institutions and plenty of companies and corporations but has somehow not produced something impactful. Despite the abundance of institutions in the area, the distances and divisions between academic institutions and the industry is proving to be an obstacle against them working together. He felt such an untenable situation needed to be rectified with collaborations between them planned accordingly. A Senior VP of Permanis Sdn Bhd Mr Renganathan Tewagudan welcomed the discussions saying that they have been waiting for the opportunity to meet face to face with UKM management as well as representatives of other companies for a long time. The company, he said, took in many UKM students for industrial training as well as employing many of its graduates and looks forward to have discussions for collaborations and the sharing of ideas, research and facilities with UKM. Permanis has already started a non-official collaboration with UKM primarily with the Faculty of Science and Technology (FST), normally using its research and laboratory facilities. “We don’t have a big Research and Development facility as 90% of our products are developed and approved by our main company Pepsi Cola International in the United States (US). But recently we have started producing our own products that focuses on beverages with local flavours. That is why we want to collaborate with UKM, because we have the know-how to make the beverages but don’t have the facilities for research,” Mr. Renganathan said. He said Permanis would also like to work with the Faculty of Engineering (FKAB), for its engineering tools and resources; the Solar Energy Research Institute (SERI) for green technology, energy management and pollution control with the hope their cooperative efforts can contribute to the community as part of its Corporate Social Responsibility (CSR) to the Bangi area. Mr. Renganathan said Permanis would also like to take in more UKM students for industrial training as it was happy with the quality of the students as well as the UKM graduates that it employs. Hitachi, Denso and Sapura also presented their company profiles and areas for possible collaborations. Prof Noor Azlan said the round table discussions is the first of many such discussions with the corporate sector in and around Bangi.